Remember a while ago when we were talking about Sick Building Syndrome (SBS) and Building-Related Illnesses (BRI)? (If not, here’s the article.) We discussed how modern tightly-sealed buildings can produce systematic indoor air quality (IAQ) problems. Proper ventilation and HVAC controls can help correct these problems. But unfortunately, moisture is still the root cause of many IAQ problems that cannot be solved without first going to the source. Most moisture problems result from water movement through the building envelope. 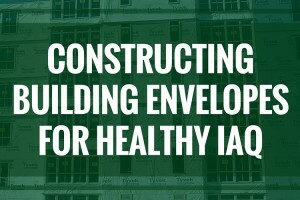 The building envelope should be the first line of defense against indoor air quality and moisture problems. Defined as “the physical separator between the conditioned and unconditioned environment of a building” the building envelope is made up of the building’s bottom floor slab, roof, exterior walls, windows and door systems. It should provide protection and separation from outdoor air, water, heat, noise and pollutants. If the building envelope is not properly designed and installed, the ventilation system will be fighting an impossible battle trying to control pollutants and moisture-related IAQ problems. 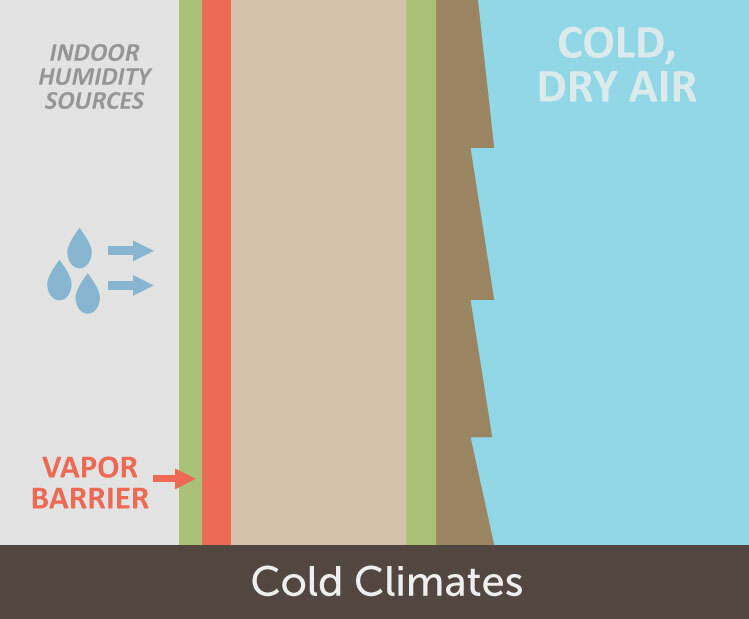 How Does Moisture Affect IAQ? Most people don’t think of moisture as an IAQ problem. But moisture can seriously impact occupant comfort, health and safety. Also let’s not forget that moisture does serious damage to building materials. High humidity levels can cause condensation in building cavities that lead to the break-down of building materials, damaging mold growth and ineffective building insulation. This, of course, amplifies existing moisture and IAQ problems. Outdoor humidity can move through building cavities via air movement or vapor diffusion. We need to understand these concepts in order to design effective building envelopes. Air movement of water vapor occurs when water molecules essentially catch a ride with air molecules as they travel from place to place. It accounts for approximately 98% of all water vapor movement. Unwanted air movement often occurs around windows and doors of buildings, or through cracks and crevices in building materials. When air enters (infiltrates) or exits (exfiltrates) the building, water vapor can become trapped or condense within the building assembly. Air infiltration is of special concern in hot and humid climates because it can lead to increased indoor humidity and condensation on cold, air-conditioned surfaces. In these areas, air-transported moisture is thought to be the leading cause of moisture-related problems in buildings. When there is unequal water vapor pressure on either side of a wall, water molecules may try to achieve equal pressure by traveling through the wall. This process is known as vapor diffusion. The water vapor pressure difference and the permeability of building materials will determine how much water vapor that diffuses through the wall.We can control diffusion by choosing building materials with the correct permeability rating and installing them in the correct part of the building assembly. The ultimate goal here is to prevent condensation from occurring. Condensation occurs when the water vapor in the air meets cool surfaces at or below the dew point temperature. Excess moisture in the air makes is much easier for condensation to form. We can prevent condensation by making sure that water vapor doesn’t get trapped in building assemblies, and that it doesn’t contact surfaces below the dew point. It’s quit the delicate balancing act. But proper building envelope design can help us achieve that balance. Here are some considerations for an effective moisture-controlling building envelope. How Can We Design Building Envelopes that Prevent Moisture Problems? The permeability of building materials helps keeps determine how much (if any) water vapor can travel through it. Both permeable and impermeable building materials can be used properly used in a building assembly. In mixed climates, highly permeable materials can help decrease the chance of moisture entrapment. 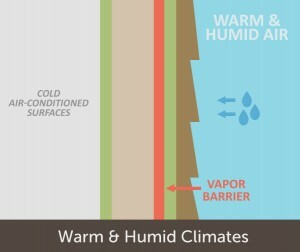 In hot or cold climates, impermeable materials help prevent water vapor form reaching building materials at or below the dew point, where condensation would occur. Vapor barriers are ranked on a permeability scale. The permeability rating is found by measuring how much water can pass through the material in an hour with a fixed vapor pressure difference. The climate will determine not only the correct permeability rating, but also where vapor barriers should be placed within the building envelope. In cold climates, vapor barriers should be placed toward the inside of the building envelope to prevent indoor humidity from reaching cold exterior surfaces where condensation can form within the wall assembly. In cold climates the biggest concern is that indoor humidity will try to diffuse out of the building. This means that water vapor is traveling from the inside to the outside. If indoor humidity reaches cold outside surfaces, condensation can form inside the building assembly. In this case, placing an impermeable vapor barrier toward the interior of the wall will keep indoor humidity from traveling through the building assembly to cold exterior walls. An appropriate vapor barrier might take the form of a wall coating, vinyl wallpaper or a plastic sheet behind drywall. Additionally, indoor humidity should be controlled in indoor climates to minimize moisture diffusion. Common sources of indoor humidity including bathrooms, laundry areas, kitchens, people, pools, hot tubs, steam showers, cleaning and building occupants. In hot and humid climates, vapor barriers should be placed toward the outside of the building envelope. This prevents outdoor humidity from reaching interior parts of the building envelope and forming condensation on cold, air-conditioned indoor surfaces. In hot and humid climates, outdoor humidity will try to work its way inside cool, air-conditioned buildings. Condensation will occur if humidity diffuses through the building envelope and reach cold indoor walls and surfaces. In this climate, semi-impermeable vapor barrier should be installed toward the exterior of the building envelope. This will prevent humidity from traveling through building materials and condensing within the wall assembly. The majority of the United States deals with a mix of climates over the course of the year. Seasonal changes present a unique challenge because there’s a risk for condensation during both cold winter days and hot, humid summer days. In mixed climate situations, no vapor barrier should be installed. This may seem counterintuitive, but it is essential that the building envelope remain breathable from both the interior and exterior. While this solution cannot prevent condensation, it does promote drying and reduce the risk of moisture entrapment within the building assembly. The ventilation system should work with the building envelope to control air and water vapor movement. This can be done through pressurization, or using differences in air pressure to affect air movement. In cold climates you want to keep indoor humidity from reaching cold exterior surfaces. To achieve this, buildings should be under a slight negative or neutral pressure. In hot, humid climates building pressurization should be positive to keep warm air from contacting cold, air-conditioned surfaces inside. Buildings in mixed climates will have to adjust HVAC controls according to appropriate settings for the current season and weather conditions.